A half-century ago on June 11, 1965, an early-morning flood swept through the streets of Sanderson, TX, carrying away houses, railroad cars and children, claiming 26 lives, destroying 75 homes and ripped up 16 miles of RR track. 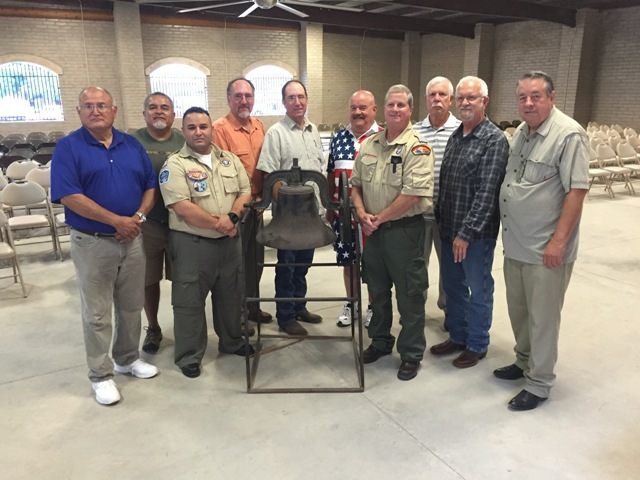 July 4, 2015 a Memorial service was held in remembrance. L-R: Danny Montalvo, Carlos Munoz, Jimmy Davis, Marvin Davis, Curtis Schroeder, Don Deaton, Condie Rogers, Danny Hodgkins - Not shown is John Stutes and Rick Marquez. Called into service were young men of Boy Scout Troop 166 and Boy Scout Explorer Post 160, which was detailed in Boys Life Magazine in 1965. Scouts carried vital messages on bicycles through flooded streets, treated the wounded and carried people from flooded homes. This was the time that the town of Sanderson looked like the Mississippi River. Shortly after 7:00 am on June 11 a wall of water engulfed Sanderson and did not start subsiding until around 11:00 am. 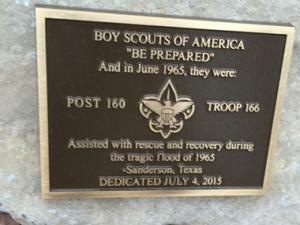 Danny Hodgkins was a 17-year-old high school student and an Explorer Scout when the flood hit. With the water still rising, he and a buddy quickly jumped into action. “We started going door to door, screaming and hollering for people to get out,” he recalled. When the water dropped, he and other Scouts started taking orders from Sheriff Cooksey at the courthouse, helping people get out of their homes and retrieve their belongings. “They were completely mentally and physically exhausted, so we pitched in and helped where we could,” he said. In the weeks that followed, Hodgkins and the other Scouts did whatever was necessary. “We were walking Sanderson Creek, looking for bodies. We did find some. Children with their clothes completely ripped off and two other bodies from the cemetery. Not a memory I relish, but something that happened,” he said. “Unidentifiable. And once I did find them, I didn’t want to know a name,” he added. Soon, accounts of casualties and missing persons began to mount. “I had worked at Harvey’s Restaurant, and one of the ladies there had quite a few kids. Her family had pretty much washed away,” he recalled. “Everyone in Sanderson knew everyone, and when you see that happen, you’re just kind of blown away,” he added.